Lawrence of Berkley, L. Adams, and I hit the road Saturday morning for a little photo expedition to the Wood County Historical Museum. 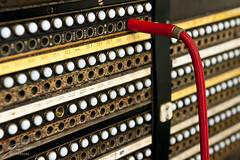 Perhaps the most interesting subject within their infirmary was an old telephone switchboard. We ended up spending most our time there trading off working that artifact. Sadly there wasn't much information about it, but I suspect that it may have come from a hotel or business rather than Bell.